When I was pregnant with our sweet Boy, Daddy and I went to the bookstore each week and picked out a book for him. The very first book we chose for him was The Little Engine That Could. It is such a wonderful story and we found a book that told the story with the most beautiful illustrations. 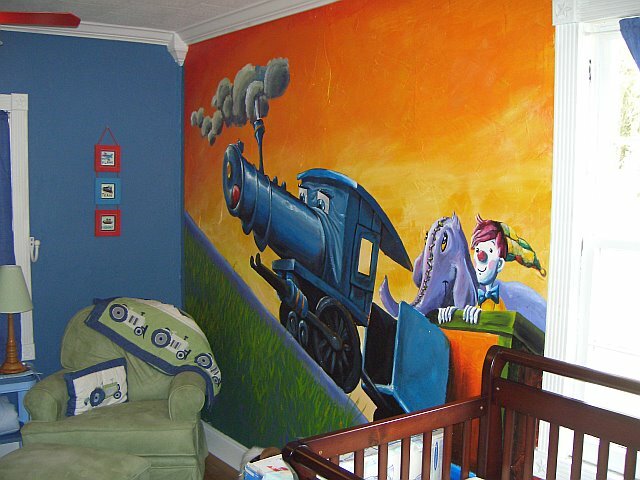 I came home from work one day to find that Daddy had painted a mural on the baby room wall, a picture of the Little Blue Engine from the story. It was beautiful. Boy is 3 years old now, and has developed a recent obsession with trains. He builds his tracks and watches Thomas the train on TV. Even when he plays in his sandbox, he usually is quietly making sand hills for the trains to travel. He lines them up and pushes them over the tracks for endless amounts of time. I find it endearing. I sit on his bed in the evening and my heart swells as I hear him read this story to me. When building his tracks, he often says "Daddy, I can't do it...Help, Daddy do it". But today, Daddy sat at his computer, I sat on the couch with Miss E, and we listened as he built his tracks (all by himself) and said "I think I can, I think I can, I think I can, I think I can". You're learn'n him right, Mama. What a sweet boy.